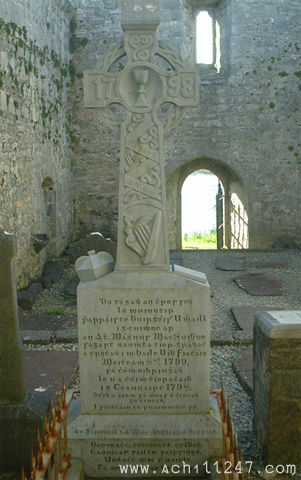 The memory of Fr Manus Sweeney, the priest hanged by the British for allegedly collaborating with the French invaders during the 1798 uprising, was so strong that no monument was deemed necessary until a century after his death. During the centenary commemorations in 1898 it was decided to mark his life - and death - with a monument at his grave in Burrishoole (below) and the erection of a public hall in Newport. The cross at Burrishoole is inscribed in Gaelic on one side and in English on the other, and was unveiled on 9th June 1912 following Mass at Burrishoole.